Why Draftech for 3D Modeling? The image of the General Motors drafter, in suit, tie, and coke bottle glasses, hunched over his drafting board, preparing a 3D cutaway of a V8 engine (in ink!) is now relegated to a display case in an industrial museum. How did we ever get things done? The advent of reliable 3D modeling software has revolutionized the way we design most everything. Now, one designer can produce in a day what once took a whole department full of drafters and designers a week! However, there are still issues. 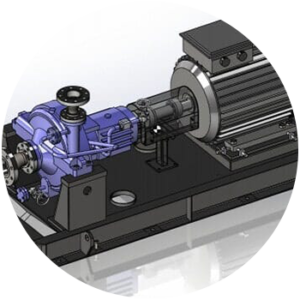 To effectively utilize the advantages of 3D modeling software, we need highly trained, experienced technicians. Parts, weldments, sub-assemblies and assemblies are connected parametrically in ways that makes proper development of those models imperative for smooth workflow through the various shops, manufacturers, and assembly lines. Anyone with any experience in large assemblies knows that a manufacturing neophyte can wipe out the productivity gains that we expect from our software. At Draftech, we’re proud to offer technicians that can produce thoughtful designs, presented in functional models, which can be economically manufactured. We have extensive experience with manufacturing methods and the functionality of various shop equipment. We’ll be asking the right questions about your shop capabilities, which aspects will be outsourced and to whom, and where you obtain your material. We’ve developed a rapport with many suppliers over the years, and will have suggestions for alternative resources. Our techs will be familiar with advanced software techniques, like FEA, realistic rendering and animation. Draftech will help you get your models tested, and then presented in the most favorable format.